Known to many as the Sunshine State in the United States, but also home of the state run lottery, Florida Lottery that is amongst one of the most popular lottery games in the United States. The Florida Lottery operates over 20 ways to win cash that can change your life. As of September 8, 2009 a total of 963 tickets had matched 6-of-6 in Florida Lotto to win or share a jackpot. Of these, 27 expired, never being claimed by ticketholders. The first tickets were sold on Friday, April 29, 1988; the first drawing was on Saturday, May 7, 1988. Florida Lotto is a pari-mutuel game, where prizes are based on the total number of tickets sold, and the number of winners for each prize level. Originally, 25% of all ticket sales accumulated in the jackpot prize pool. If no ticket were to win the top prize pool for a drawing that prize pool would roll over to the next week’s jackpot prize pool. Before each drawing the Florida Lottery would estimate and advertise a jackpot based on expected ticket sales. The accumulated prize pool for the jackpot represented the current value of the 20-payment yearly annuity that would be awarded to the winner(s). The Lottery then advertised the total stream of payments such annuity would yield as the jackpot. In weeks where sales figures exceed expectations the Lottery would revise the estimated jackpot figures. A Florida Lotto drawing from October 13, 1990. Beginning April 3, 1990, players could elect to use Quick Pick to have a lottery terminal select their numbers. On February 6, 1993, the prize structure was revamped to increase the percentage of sales toward the jackpot pool, allowing for a minimum jackpot of $6 million. The game would go unchanged until October 21, 1998, when the Florida Lottery began allowing winners to receive their jackpot in lump sum in lieu of the 20-payment annuity. In order to receive the lump sum winners must make the election within 60 days of the drawing. Players electing lump sum would receive their share of the cash in the jackpot pool. The cash value option was elected for the first time for the October 24, 1998 drawing, as two players split a $12,780,000 (annuitized) jackpot. The cash in the jackpot pool for that drawing was $8,238,609.84. One player chose the 20 annual payments of $319,500 each. Jay Jasperson and Kay Stephens of Tampa became the first jackpot winners to choose lump sum payment; they split $4,119,304.92. On November 15, 1998 the Lottery increased the length of the annuity option to 30 annual payments. This in effect allowed the Lottery to artificially increase their advertised jackpot amounts without actually increasing the cash in the jackpot pool. The then-new cash option remained. On November 28, 1998 two tickets split the $16,800,000 jackpot; the jackpot cash pool was $8,749,944.72. One player elected to receive a lump sum of $4,374,972.36, while the Moen Family Partnership from Jupiter became the first to select the 30-payment annuity, receiving $280,000 per year. Despite the nearly identical jackpot cash pool as in the October 21, 1998 drawing, the change to the annuity stream allowed the Lottery to announce a jackpot prize of nearly $4 million more. On January 9, 1999, the Lottery began guaranteeing the estimated jackpot. When sales would otherwise create a jackpot below the estimate, the Lottery would supplement the prize to guarantee the 30-payment annuity. If the jackpot pool exceeds the estimated amount, then the player would receive the larger annuity stream if the annuity is chosen. Currently, winners have 90 days from the drawing in which to choose the cash option, instead of the original 60. On October 24, 1999, the most significant change to Florida Lotto occurred. Four numbers were added to the field to make a total of 53 numbers for players to choose from, increasing the difficulty to win the jackpot. A second weekly drawing, on Wednesday nights, also was added, the first mid-week drawing was on October 27, 1999. The first Wednesday drawing included the new highest number, 53. Because of the twice-weekly drawings, the minimum jackpot was reduced to $3 million. Starting with the October 14, 2009 drawing, the 3-of-6 prize minimum prize is $5. Previously, the minimum was $3.50. On January 19, 2008, the Lottery changed its advertised jackpot policy again. The Lottery announced that all jackpot amounts are guaranteed. The annuity jackpot now is the guaranteed amount announced by the Lottery in advance of the drawing. 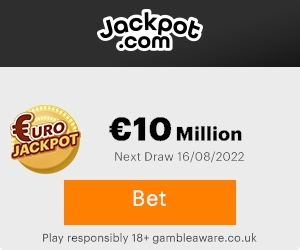 The lump sum option is fixed at the current value required to fund the declared Jackpot annuity based on the interest rate in effect on the date of the Lotto drawing (or prior business day). If sales exceed Lottery expectations, the Lottery would no longer award the player the additional prize amounts, keeping the surplus in a special prize pool. Shortages are funded from any unclaimed prizes. On October 11, 2009 at 6:00 am the Florida Lottery began sales of Lotto Xtra. The first drawing offering the enhanced prizes was held on October 14, 2009. This feature is similar to Powerball’s PowerPlay option where players can elect to add $1 to each game, multiplying non-jackpot winnings by either 2x, 3x, 4x, or 5x. The odds for each multiplier for each drawing are 1:4. As in Powerball, the multiplier for Xtra is selected by computer and shown on a monitor while the regular Lotto numbers are drawn by a ball machine. Additionally, Florida Lotto tickets purchased with Lotto Xtra win a free play with Lotto Xtra for a 2-of-6 match. To promote the Lotto Xtra feature, the Florida Lottery guaranteed that Lotto Xtra tickets matching 3 of 6 would have a 5x multiplier through December 27, 2009. The Lottery has extended the promotion; no end date has been set. Also starting with the October 14, 2009 drawing, the minimum prize for 3 of 6 was raised from $3.50 to $5. On February 14, 2010, the Florida Lotto minimum jackpot was reduced to $2 million. On April 14, 2010, Florida Lotto produced its 19th consecutive rollover. This broke the previous rollover record of 18 set on April 3, 2010. As further evidence of eroding Lotto sales to the Powerball, the Florida Lottery changed the jackpot estimated rules again in mid-2010 to reduce the minimum increase in the guaranteed jackpot between drawings from $2 million to $1 million. The first such $1 million increase was on August 11, 2010, marking the smallest ever increase in the advertised jackpot following a rollover drawing.